I have heard my mom say this in numerous occasions whenever she would hear news that her friend's child is getting married or is having a baby. This would be followed with a short update on our (mine and my sister's) lives and a brief travel back when we were still kids. I guess, this is what Elton John meant when he sang "The Circle of Life." How we go from infancy to childhood then to our teenage years and later on to adulthood. It was just ten years ago when my school planner was filled up with debut parties that we have to attend almost every weekend. This was combined with college entrance exams and of course our Senior Grad Ball. 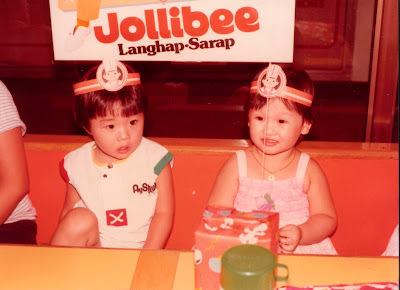 Fast forward, ten years after we're now attending each others weddings and lately, Paul and I have been getting more and more invites to kiddie birthday parties hosted by our high school and college friends. The table is going around now. No longer were we the ones carried by our parents as we blow our three little candles. Back then, the sight of the happy looking bee or three funny clowns would be the highlight of our party. The popular venue would either be at a fast food chain or in our very own homes. Now, kiddie parties are taken just as seriously as preparing for ones wedding. I was shocked when my sister-in-law told me that she had to make reservations to my nephew's birthday venue a year in advance. Parties are now more festive with numerous food carts and art stations situated around the venue. Parents would also consider having the party at a village clubhouse or an events place to accommodate all of their guests. Paul and I watch in delight as our friends would attend bringing their own kids and would gamely participate in games just to see the bright smiles on the faces of their little ones. Someday, perhaps, we'll be just like them. In the meantime, we enjoy posing in front of the photo booth and lining up for the food carts. 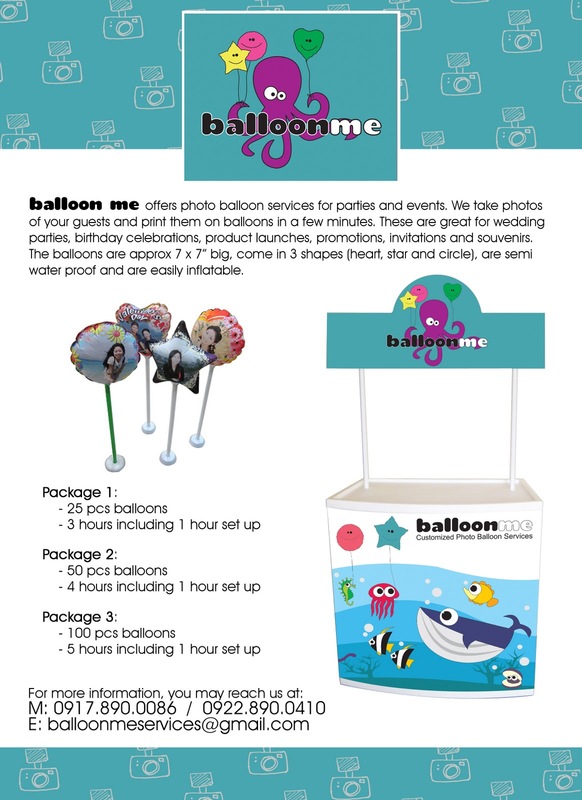 Photo booths were a big hit for the past two years and lately, we notice a new innovation that makes one's party even more personalized -- introducing Balloon Me! It's a photo balloon service targeted for parties and special events. The procedure is easy: they would take photos of your guests on the spot and print them on balloons in a few minutes. The balloons are approx 7 x 7" big, come in 3 shapes (star, heart and circle), are water proof and are easily inflatable. I can just imagine kids watching in delight as their photos are being printed on the balloon and inflated for them to proudly carry around. I'm availing this for my nephew's birthday this December and I can't wait to see the venue decorated with these pretty little balloons with his adorable face on it. You can either opt to have them build a small station in your party to print the balloons on-site or to order pre-printed balloons to be given as a souvenir or a party decor. For more information, call Lorraine at 0917-8900086 / 0922-8900410. How cute! I want this! Hahah! This is really great, i like it. Thank you sharing this blog.